HomeWhich Jew or Talmudic Proselyte Do You Choose, Maraka? Which Jew or Talmudic Proselyte Do You Choose, Maraka? What’s Good for the Choose? 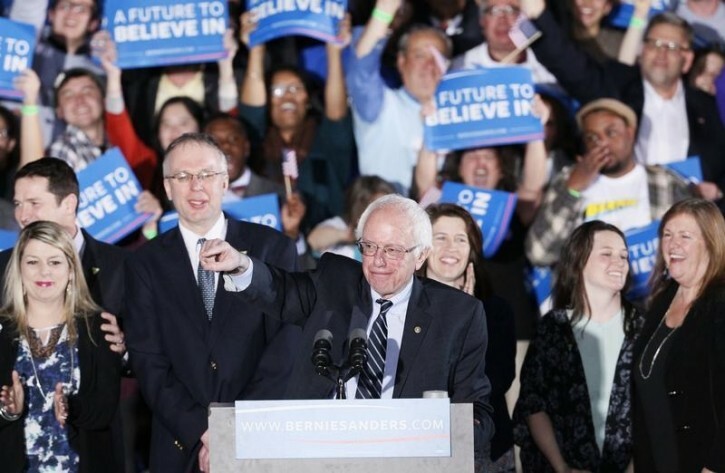 New York – Jewish Presidential hopeful and Democratic New Hampshire primaries winner Bernie Sanders doesn’t talk much about his Jewish background but he has played a significant role in the 1989 US Supreme Court decision to allow Hannukah menorahs to be displayed on public property countrywide, research conducted recently by Chabad-Lubavitch revealed. In the 1980s and early 1990s, Chabad-Lubavitch emissaries introducing the public menorah were faced with opponents claiming that the Jewish displays violated the separation of church and state. Defenders argued that the menorahs were protected as a matter of freedom of speech and freedom to practice one’s religion. The cases were taken to court. One of these disagreements occurred in Burlington, Vermont during Bernie Sanders’ term as mayor of the city from 1981 to 1989. In December of 1983, Chabad-Lubavitch emissaries to Vermont Rabbis Yitzchak and Zeesy Raskin, approached Mayor Sanders’ office and requested permission to light a large 8-foot menorah on the steps of City Hall. Rabbi Raskin then extended an invitation to Mayor Sanders to light the menorah, which he accepted, the research conducted by Chabad.org’s Associate Editor David Margolin found. Three years later, in 1986, the Chabad emissaries asked permission to allow a 16-foot tall menorah to be erected in Burlington’s City Hall Park during all eight days of Chanukah yearly. The Sanders administration welcomed these requests, and granted full permission, but was immediately confronted by the American Civil Liberties Union who complained the menorah in a public space violated federal laws of the separation of church and state, also known as the Establishment Clause, which prohibits placing religious symbols on public property if it results in promoting religion. The ACLU was not pleased by the decision to display the menorah and threatened to file suit against the City of Burlington, which caught the attention of the New York Times. “‘It is not because the governor and the mayor are Jewish that the menorah is in the park,’ Mr. McNeil said. ACLU and activists decided to go through with filing a suit against the city in June of 1988 over the conflict. Sanders and his administration chose to vigorously defend their position in court despite much opposition. But days before Hannukah 1988, US District Judge Franklin S. Billings, Jr. ruled in favor of the Burlington menorah, The New York Times reported. Bernie Sanders’ and his administration’s deep involvement in the case contributed to opening the path for the US Supreme Court decision in the Allegheny v. American Civil Liberties Union case in which the Court considered the constitutionality of two recurring holiday displays located on public property. In addition to his fight for the menorah display, the Chabad-Lubavitch research showed Bernie Sanders had expressed strong admiration for Rabbi Menachem Mendel Schneerson, also known as the Rebbe, the last Lubavitcher Rebbe considered one of the most influential Jewish leaders of the 20th century. Sanders joined the national “Education Day” proclaimed annually on the date of the Rebbe’s Jewish calendric birthdate, and proclaimed Education Day in Burlington in honor of the Rebbe’s 81st birthday in 1983 and 83rd birthday in 1985. 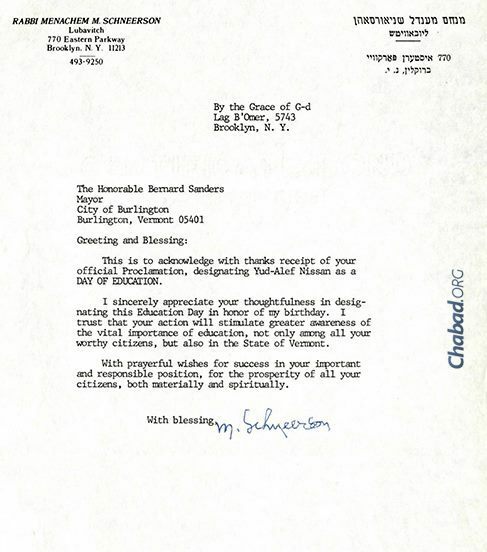 The Rebbe wrote a letter retrieved by Chabad.org to thank Sanders for the decision.